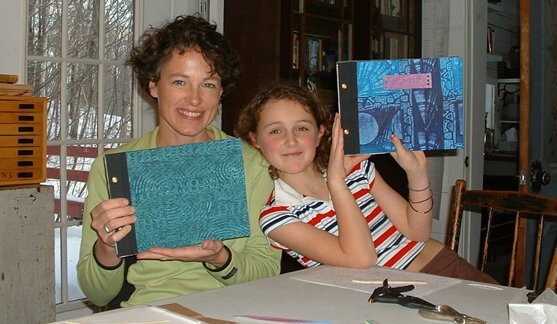 This proud mother-daughter team show their new handmade journals. Students of all ages and abilities are welcome in Susan's studio classes. She works with adults and children, writers, artists, and enthusiasts at all levels of experience. To receive notification when a new series of classes is posted on the website, email Susan Bonthron. She will gladly add you to her email list of interested book artists. (She does not share her list with anyone.) Click here to see an updated list of class offerings (or the date when the next schedule will be posted). 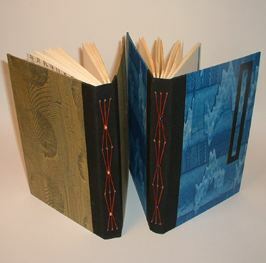 Classes are held here in the sun-filled studio at Otter Pond Bindery. 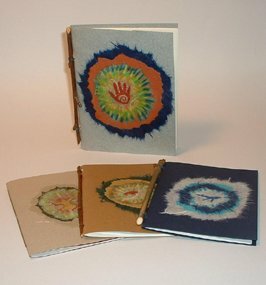 Learn an array of techniques and create a pile of your own paste paper for future projects: journal covers, end papers, luminaria, cards and envelopes. 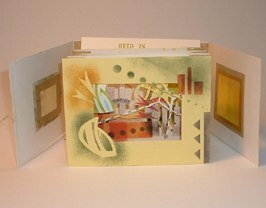 Make a series of single-section twig bound "spirit books" with collaged covers, great for gifts and cards. 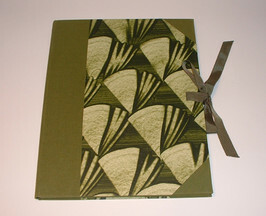 Create a 3-section hardbound journal with cloth spine and decorative exposed sewing. Excellent for both beginning/intermediate students. Who doesn't need another photo album? 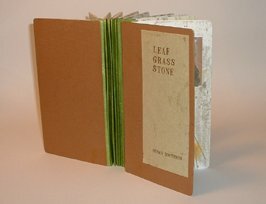 Construct a cloth and paste paper-covered album with stubs and adjustable screw-posts to allow expansion. 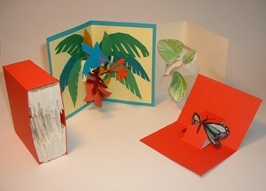 Create 35 mechanical paper pop-up structures with a box to hold them; then pick a structure to develop and play with. Great ideas for future books and cards. 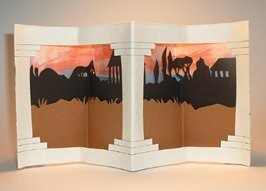 Bind a printed story or poem and illustrate it with a 2-panel 3-D panorama with mat board covers (or just bring your ideas and add your story/poem later). Construct a 3-D accordion carousel (aka "Star Book") with hardbound covers. Optional: Bring a poem or other writing you'd like the book to illustrate. 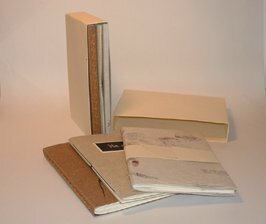 Make three different 2-section journals bound with handmade paper and enclosed in a card-stock case. 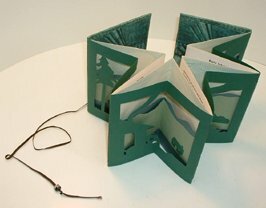 Great introduction to book arts. Suitable for all levels of experience. 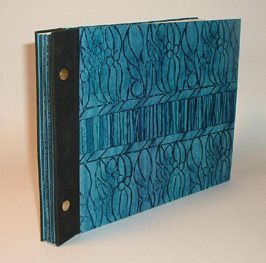 Choose paste papers, fold text pages, and cover and sew a 6-section hardbound journal with Coptic binding and decorative spine sleeves. Create a "personal field journal" with mylar windows, pull-outs, and embedded secrets. Optional: bring small flat objects/photos/mementos etc. to enclose. 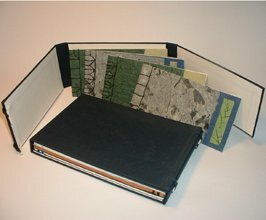 Using paste paper, book cloth and boards, bind a beautiful portfolio to hold photos, poetry, graphics, or music. 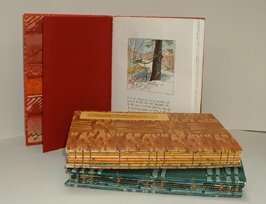 Ribbon closure, laminated book-cloth-and-paper flaps. Create and play with a "stage set" of overlapping images (postcards/drawings/ paintings/photos) and enclose them in a box. Optional: bring your own set of images on 4" by 6" cards. Facility with razor knife helpful. 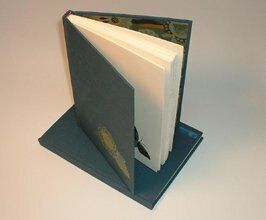 Learn to make a classic hardbound cloth-covered flat-back journal with recessed title and island paste downs. Some experience helpful. Make several Japanese side-bound books enclosed in a traditional Japanese three-fold chitsu or hardbound case. Some experience helpful. Studio classes at the bindery provide such a special day-long extravaganza for the senses that students nicknamed it The Art Spa. You arrive with nothing in hand but your energy and desire to learn. 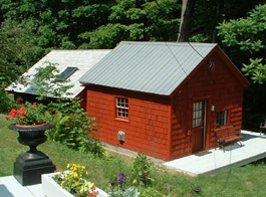 The bindery is located on a pond and surrounded by decks, gardens, stone walls, fields and forest. You spend the morning learning a form, folding and pasting, or exploring the magic of paste paper. You are served a gourmet lunch - included in the price of each workshop - in a mid-19th century schoolhouse full of intriguing antiques and curiosities. 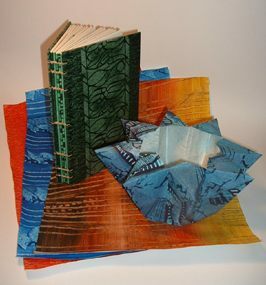 In the afternoon you finish your work and go home with a beautiful handmade book or pile of paper as well as printed, illustrated instructions. You are filled with ideas and reawakened by the inspiring work and conversation of your fellow students - a day full of delight and discovery to renew your creative imagination.